Doc Savage stories, 181 in total, first appeared in Conde Nast's Doc Savage Magazine pulps. The original series has sold over 20 million copies in paperback form. The first entry was The Man of Bronze, in March, 1933 from the house name "Kenneth Robeson". John L. Nanovic was editor for 10 years, and planned and approved all story outlines. The early stories were pure pulp "supersagas", as dubbed by Philip Jose Farmer, with rampaging dinosaurs and lost races, secret societies led by dastardly villains, fantastic gadgets and weapons, autogyros and zeppelins, death-dealing traps and hair-raising escapes, and plots to rule the earth. In the first few stories, Doc and his aides killed enemies without compunction. An editorial decision made them kill only when necessary for a more adventurous kid-friendly magazine, unlike the bloodthirsty competitor The Shadow. 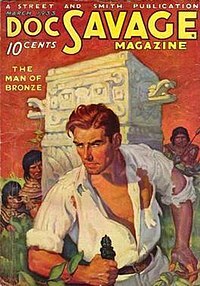 Doc Savage Magazine, March 1933, "The Man of Bronze", illustrated by Walter M. Baumhofer. Doc Savage was the lead story, often illustrated with line drawings. Exciting covers were painted in bold colors by Walter M. Baumhofer. Other adventure stories filled up the back, and there was a letters column. Kids could join the Doc Savage Club complete with badge, or follow "The Doc Savage Method Of Self-development" to build muscle and memory. In Depression America, 10-cent pulps with hundred of pages were handed around barracks or bunkhouses or schoolyards, a popular form of entertainment when people were unemployed and poor, and fantastic stories were a pleasant diversion from real life. Lester Dent wrote most of the stories, with fill-ins by Harold A. Davis, Alan Hathway, and William Bogart that were overseen or rewritten by Dent. By 1938, as the economy improved, pulps were on the wane and faced competition from comic books. During World War II, ordinary men and women performed fantastic deeds daily in exotic corners of the world, and fantastic pulp adventures seemed childish. Charles Moran became editor in 1943 and changed the format to suspense and realism. Doc used fewer gadgets and standard detective tropes. By 1946, in Measures for a Coffin, Doc is busting crooked investment bankers. Doc pared down his team, working mainly with Monk and Ham, and sometimes alone. Successive editors carried this format, and Babette Rosmond retitled the magazine Doc Savage, Science Detective in 1947. By this time, the Doc stories were shorter than other stories in the magazine. Covers rarely showed Doc anymore, becoming detective-generic, abstract or illustrating non-Doc stories. Dent may have recycled some generic detective stories as Doc tales; King Joe Cay features Doc working alone, in disguise, with no aides, gadgets, or headquarters, and an interest in the ladies. Alan Hathway's grisly The Mindless Monsters reads like a rejected Spider story. Experimenting with new formats, during 1947 Dent wrote five stories with a first-person narrator, an innocent person caught up in a Doc Savage adventure, with one story narrated by Pat Savage, I Died Yesterday. Still, sales fell. The magazine went bi-monthly in 1947, then quarterly in 1949. Editor William de Grouchy was brought back to revive the magazine, and asked Dent to return to larger-than-life stories. Dent took a new direction, with Doc infiltrating Russia and outwitting "the Ivans". This story, eventually titled The Red Spider in the Bantam run, was killed and shelved by editor Daisy Bacon. She oversaw three pulp-style adventures for the last three issues, but the magazine was cancelled in 1949. In the last story, Up from Earth's Center, Doc delves into a cave in Maine and meets what may be actual demons, and runs screaming in terror. The saga had ended. Until 1964, when Bantam Books revived the pulps as paperbacks. A huge selling point were the striking photo-realistic covers of a vibrant, widow-peaked, shredded-shirted Doc painted by James Bama and later Bob Larkin, Boris Vallejo, and others. Bantam reprinted all the stories, concluding in 1990, but not in the original publication order, and a few stories were retitled. They started as single volumes with numbers. As the stories got shorter, Bantam combined double novels with numbers, and finally Doc Savage Omnibuses with four or five stories without numbers. The rejected The Red Spider manuscript was discovered in 1975 by Will Murray and published during the Bantam Books print run as #95. In recent years, Anthony Tollin's Sanctum Books, initially in association with Nostalgia Ventures for the first 16 releases, has reprinted all 182 (including the initially unpublished The Red Spider) of the Doc Savage stories from the thirties and forties, usually at least two to a volume, using Baumhofer covers, and some Bama covers for variant editions. The reprint project, 87 volumes in total, was completed in 2016. Magazine Management Co, Inc, a Marvel imprint also called Curtis Magazines, published eight black-and-white illustrated magazines as a movie tie-in. The cover of the first issue was an elaboration of the poster for the 1975 film Doc Savage: The Man of Bronze painted by Roger Kastel, with all of the other covers painted by Ken Barr. So, for eight issues, a Doc Savage magazine reappeared on newsstands. The stories were reprinted in Showcase Presents: Doc Savage and again as Doc Savage Archives: Vol 1. 1975 Aug 1 Doom on Thunder Island Doug Moench John Buscema / Tony DeZuniga The "Silver Ziggurat" destroys skyscrapers with lightning, and leads Doc's crew to a Pacific Island of electrically-enhanced tigers and "manimals". Includes an article on the Doc Savage movie and interview with director George Pal. 1975 Oct 2 The Hell Reapers Doug Moench Tony DeZuniga Killings by a mad Viking lead Doc's crew to an Arctic paradise and the menace of the Reptilians! Includes an interview with Ron Ely about his role as Doc Savage. 1976 Jan 3 The Inferno Scheme Doug Moench John Buscema / Tony DeZuniga "Mechanoid" animals who steal diamonds lead Doc to a castle in Maine and a madman with a plan to burn the world! Includes a solo tale starring Monk, A Most Singular Writ of Habeas Corpus, with art by Rico Rival. 1976 Apr 4 Ghost Pirates from the Beyond Doug Moench Tony DeZuniga / Marie Severin Eerie glowing assassins striking in Manhattan lead Doc's crew to Morocco and the Sahara Desert after a long-lost treasure. 1976 Jul 5 The Earth-Wreckers! Doug Moench Tony DeZuniga Doc scours the globe for gigantic jigsaw pieces that lead his crew - and Pat! - to Loch Ness and the Iron Mask! Includes articles "The Pulp Doc Savage" and "An Interview with Mrs. Lester Dent". 1976 Oct 6 The Sky-Stealers! Doug Moench Tony DeZuniga Robotic Egyptian gods plunder Manhattan's museums and lead Doc's crew to Egypt, the Pyramids, and the City of the Dead! Includes an article on "Renny" by Bob Sampson. 1977 Jan 7 The Mayan Mutations Doug Moench Val Mayerik / Tony DeZuniga Doc and his crew delve into the jungles of Peru to find giant insects, tree-dwelling natives, and the secret origin of the Mayan race! Includes an article on "Johnny" by Bob Sampson. 1977 Spring 8 The Crimson Plague! Doug Moench / John Warner / John Whitmore Ernie Chan All over the globe, scientists are left mindless husks, victims of the "Octo-Brain". When Doc's aides are kidnapped, he rushes to confront a would-be dictator in the savage land of—Hollywood! Final issue. The list includes original Doc Savage novels either entirely new or developed from Lester Dent's stories and notes. 1979 Jul In Hell, Madonna / The Red Spider 182 Lester Dent Doc infiltrates Communist Russia to learn whether the Soviets have developed the atom bomb—and is nearly shot by a firing squad! Originally submitted on Monday, 3 May 1948 but not published until July 1979 as No. 95 in the Bantam Books paperback series. 1991 Aug Escape from Loki 183 Philip José Farmer In Doc's very first adventure, in World War I, at 16 years of age, he's shot down as a biplane pilot and thrown into a prison camp nicknamed Loki where he meets his future aides. 1991 Oct Python Isle 184 Lester Dent / Will Murray From Manhattan to Cape Town ensues a quest as dangerous as any in recorded history. One that will embroil the compassionate yet hard-fisted Doc Savage and his resourceful men in a raging struggle for control of one of history’s most closely guarded mysteries: the lost secret of Python Isle! 1992 Mar White Eyes 185 Lester Dent / Will Murray From snowbound Manhattan to the sugar-cane fields of tropical Cuba, Doc Savage and his Iron Crew wage what may be the greatest battle for survival of their careers! 1992 Jul The Frightened Fish 186 Lester Dent / Will Murray An evil genius long believed dead, a shadowy figure who masterminded World War II, now wants to plunge humanity into a new Armageddon. Trained by the same teacher, both possessed of the same genius, Doc Savage and this man have fought before. And now, as the world is about to lurch into another global war, Doc Savage must defeat his most loathsome adversary yet! 1992 Oct The Jade Ogre 187 Lester Dent / Will Murray Deep in the spider-haunted ruins of faraway Cambodia broods a twisted, armless creature with a face of jade—the Jade Ogre—whose power to project deadly, disembodied arms to any place on earth makes him the most dangerous foe Doc Savage has ever faced! 1993 Mar Flight into Fear 188 Lester Dent / Will Murray An ultra-secret State Department mission sends Doc Savage from the streets of Manhattan to the Arctic Sea, where he is targeted by the Kremlin and headed for a confrontation with a vile nemesis! 1993 Jul The Whistling Wraith 189 Lester Dent / Will Murray When the ruler of the Balkan state of Merida vanishes from his locked limousine, official Washington is baffled. The President of the United States summons the one man who can solve the mystery—Doc Savage! From Washington to Manhattan, Doc and his fighting brain trust race to unravel one royal riddle while battling the untouchable phantom potentate known as The Whistling Wraith! 1993 Nov The Forgotten Realm 190 Lester Dent / Will Murray No one knew who—or what—the strange being who called himself "X Man" truly was. He was found wandering the ruins of a crumbling Roman fort, dressed in a toga, speaking classical Latin—and clutching a handful of unearthly black seeds. From the wild Scottish moors to the unexplored heart of darkest Africa, Doc Savage and his indomitable men embarked upon a desperate quest for the Forgotten Realm! 2011 Jul The Desert Demons 191 Lester Dent / Will Murray The skies over California explode with blood-red energies that resemble demon cyclones, but behave like intelligent life. Nothing can stand in their terrible path. Men, machines, even buildings are devoured by the all-destroying Desert Demons. What are they? What do they want? 2011 Nov Horror in Gold 192 Lester Dent / Will Murray From the besieged canyons of New York to the rugged coast of Alaska, Doc Savage and his men race to resolve the riddle that brings grisly doom to ordinary citizens—and threatens the economic recovery of a Depression-besieged world. 2012 May The Infernal Buddha 193 Lester Dent / Will Murray Men called it the Buddha’s Toe—a relic so terrible it was kept sealed in a strongbox few dared open. Those who did dare, perished. From cosmopolitan Singapore to the barbaric waters of the Yellow Sea, Doc Savage plunges into a desperate struggle for control of the Infernal Buddha—before it consumes the planet! 2012 Sep Death's Dark Domain 194 Lester Dent / Will Murray Ancient Ultra-Stygia has turned into a cauldron of conflict between rival countries. Monster bats careen through the night sky and a power beyond understanding robs men of their vision. Will the Man of Bronze succumb to an unstoppable power he himself has unleashed upon mankind? From the frozen Arctic to the war-torn Balkans, Doc Savage and his fighting five follow a winding trail of terror to a blood-freezing climax. 2013 Mar Skull Island 195 Will Murray Doc Savage… and King Kong! Before the world knew them, they met! Before they were legends, they clashed! An urgent summons from his father brings young Clark Savage, Jr. to San Francisco for a mysterious mission: to locate the long-lost clipper ship captained by his legendary ancestor, Stormalong Savage. Doc Savage meets his first great challenge in the fierce prehistoric jungles of Skull Island! 2013 Sep The Miracle Menace 196 Lester Dent / Will Murray When out of work magician Gulliver Greene stumbles upon a man who claims to be Christopher Columbus, still alive in 1937, it's only the start of the most complex plot ever to involve the incredible Doc Savage. From his super-secret Crime College to a sinister island in the Great Lakes, Doc Savage and his brilliant team race to untangle the most baffling web-work of Halloween horrors ever encountered. For many weird mysteries beyond human ken converge in the Missouri wilderness in this, the wildest Doc Savage adventure yet! 2013 Dec Phantom Lagoon 197 Lester Dent / Will Murray When brazen adventuress Hornetta Hale tries to hire Doc Savage for a secret mission—but won’t tell him why—it lights the fuse for one of his most explosive exploits. From Manhattan Island to the Caribbean Sea, Doc and his fighting crew chase the most violent gang of criminals they have ever encountered in a desperate race to unlock the secret of Phantom Lagoon. Or are they more than mere criminals? 2014 May The War Makers 198 Ryerson Johnson / Will Murray All over the Midwest, cars and trucks were crashing—stopped in their tracks by an inexplicable force! Had some unseen power targeted America’s automotive industry—or was something more sinister at stake? From the nation’s car capital to the North Pole, the Man of Bronze races to stave off a strangely familiar menace only to confront a completely unexpected foe—the enigmatic Baron in Black! 2014 Sep The Ice Genius 199 Lester Dent / Will Murray When William Harper Littlejohn unearths a shadowy figure transfixed in ice, the renowned archeologist understands that he has made the most momentous discovery of his brilliant career. Can even Doc Savage control the Ice Genius once he breaks free of his icy tomb? From the Gobi Desert to war-torn Free China, the Man of Bronze and his fighting crew battle a threat so terrifying that it could change the course of human history! 2015 June The Sinister Shadow 200 Lester Dent / Will Murray When millionaire Lamont Cranston and attorney Ham Brooks are kidnapped by gunmen driving a black hearse, it spells trouble for both Doc Savage and The Shadow. This strange even puts the Man of Bronze and the Dark Avenger on a collision course that threatens to expose their deepest secrets. Will these legendary crime fighters join forces—or will the diabolical Funeral Director have the last laugh? 2015 Nov The Secret of Satan's Spine 201 Lester Dent / Will Murray Someone has gone to great lengths to keep Monk Mayfair off the wartime transport ship Northern Star to England, prompting Doc, Monk and Ham make the trip undercover to find out why. All hell breaks loose when the ship reaches the Caribbean, where Doc and his men encounter old friends, new enemies, ancient treasure, modern-day pirates, a sinister submarine and a monster hurricane that wreaks havoc on friend and foe alike. 2016 May Glare of the Gorgon 202 Lester Dent / Will Murray From the concrete canyons of Manhattan to the snowy streets post-Prohibition Chicago to a ghostly abandoned coal mine, Doc Savage and his crew track a seemingly supernatural "something" that terrorizes both the citizenry at large and the criminal Underworld in equal measure, leaving a trail of corpses with brains turned to stone in its wake. 2017 Jan Empire of Doom 203 Lester Dent / Will Murray From fog-shrouded New York to a futuristic underground kingdom in the heart of Asia, Doc Savage and his unlikely ally The Shadow wage a seemingly supernatural secret war with the Golden Master and his myriad mind-controlled minions with the fate of the world at stake! 2018 Mar Mr. Calamity 204 Lester Dent / Will Murray Prospecting in the Wyoming badlands, Patricia Savage spies a man swimming in circles––high in a cloudless sky! After he falls to his death, the dead swimmer is discovered soaked to the skin. Who is he? How did he manage to swim through thin air? 2018 Mar The Valley of Eternity 205 Lester Dent / Will Murray A letter from Doc’s long-dead father presents him with a life-changing challenge that brings him to The Valley of Eternity … and the Man of Bronze does the unthinkable: he ditches his loyal aides in favor of his cousin, Patricia—the only one who can help him succeed in the most perilous quest of his entire career! ^ "Doc Savage: His Apocalyptic Life" by Philip Jose Farmer, Bantam paperback edition, 1975, page 29. ^ "Doc and his men had a fixed policy against taking human life, even in the most heated combat." "The Sargasso Ogre", Bantam Edition, page 42. ^ "Doc Savage: His Apocalyptic Life" by Philip Jose Farmer, Bantam paperback edition, 1975, Addendum 3, "List of Doc Savage Stories", page 262. ^ "Afterword by Will Murray" in "The Red Spider", Bantam, 1979. ^ Moench, Doug; Tony DeZuniga (2011). Showcase Presents: Doc Savage. DC Comics. ISBN 978-1-4012-3125-5. Retrieved 19 March 2012.